Super Hero Boy: A video game system for preschoolers that will burn off some steam! A video game system for preschoolers that will burn off some steam! We are a pretty geeked out household, that's no secret. I'm fairly sure I've told you guys more than once I met Connor's daddy through a video game. So its no surprise that my son is already showing an active interest in computers and video games himself. The problem is, he's far too young to really operate a computer game effectively though he has the mouse down pat, and he's way too hyper to sit still long enough to make it more than a few minutes even when I do find him one that is totally mouse driven. VTech V.Smile Motion however is the perfect system for the active preschooler! The controller is very simple to use and is motion activated and it responds to being tilted in either direction and moved around. Children are not expected to sit down and be still while playing with their VTech Motion but are actually encouraged to move around! Children learn reading, math, and other skills all while having fun. I also love the fact that many of the games feature recognizable characters such as the Wonder Pets and Handy Manny which really gets their attention. The controller and functions are all very easy to use, chunky and easy to hold for little hands, and very durable. I should also add that the controller is wireless which is a huge plus but I do recommend that you purchase rechargeable batteries as wireless remotes for any video game system I've ever owned are always notorious for eating batteries way too fast. This is an absolutely great, kid friendly, family friendly, very budget conscious system. The only thing I could at all say bad about it is the fact that if your expecting graphics along the lines of the more adult video games you may be dissapointed. However the graphics are clean just more simple than that of some of the larger video game systems. If you have played any of the other V.Smile systems its along the same lines as the games are compatible. For the price the system just can't be beat hands down though. Compatible with all the other V.Smile cartridges and reasonable priced at under $50 for the entire system, you can actually find them on sale for under $40 this holiday season, you can't go wrong. 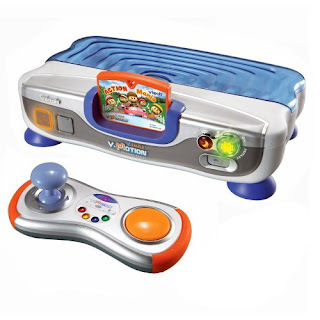 You can check out the entire line of V.Smile video game systems, games, and accessories on the VTech Kids website.